One thing that we must all come to terms with when dealing with life is knowing that there will always be those who will judge us, even if they know nothing about us. It truthfully is the people that know us the least are sometimes the people that may judge us the most. We must also learn to accept that despite being judged by others, they matter not in the least bit, because no one is perfect. No one will ever be perfect enough to judge anyone else, and therefore the only judgment we should ever worry about is the judgment of our God. Never live life in fear of disappointing others, because no matter what you do by the end of your life you will have been a disappointment to at least one person, and many people will have been a disappointment to you. Make your life your own, by being you in every circumstance. Make your own name and your own decisions! Judging others is one of the most destructive tools that we can use on ourselves. Many of us don't realize it, but when we judge others, and make our judgments known to the world, we signify to the world that we are willing and open to be judged as well. As everyone is able and inevitably makes mistakes, when we choose to judge others, the scope we have on our own lives for when we make our own mistakes will be magnified 10 times greater. 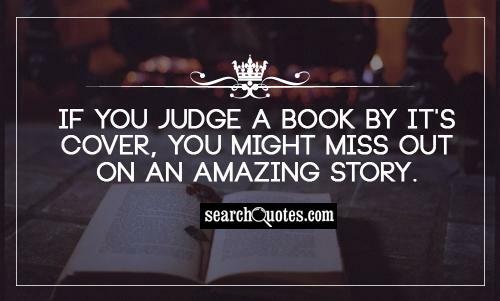 If you judge a book by it's cover, you might miss out on an amazing story. Living a righteous life full of fulfillment is living a life without the judgment of others. Sure there are people who hold views that we don't agree with at all morally, and there are those whose outward appearances may tempt us to steer clear as they may not be pleasantly accepted as social norms, but we must never let what we find disagreeable on the outside prevent us from establishing connections with people who actually may be of great help to us someday. 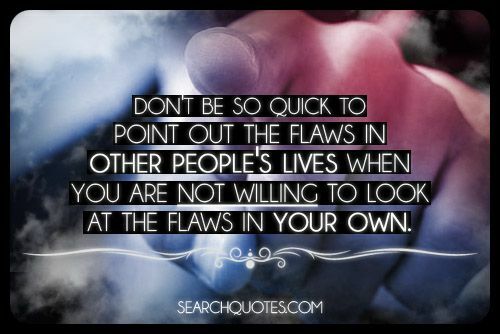 Don't be so quick to point out the flaws in other people's lives when you are not willing to look at the flaws in your own. 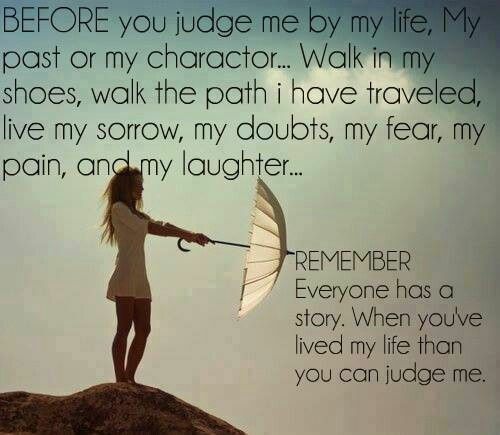 Never judge anyone. There was once an old man, that sat at the same park bench day after day. A younger gentleman that went running in this same park almost daily always saw this happy, smiling old man, and always wondered why he would just come to the park, sit and smile. Finally after about a year, his curiosity got the best of him, and he stopped to ask the older gentleman why exactly he sits in the same spot daily and just smiles at everyone who passes by. Don't judge me until you know me. Don't underestimate me until you challenge me. And don't talk about me until you talk to me! In becoming who we are as a person we have to be willing to shake away from the judgment that we think we will see from others from being who we are. One thing about life is, there will be people that enter into your life, even at a distance, who will make no effort to get to know you, but will instead just choose not to like you. 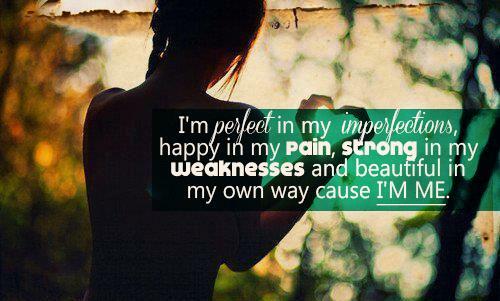 I'm perfect in my imperfections, happy in my pain, strong in my weaknesses and beautiful in my own way cause I'm me. Even though it may not be put out, and it may not seem like being who you are can take you places that are only in your dreams at the moment, when you just keep it real, and be the person you really are, you will be put around the right opportunities and open doors. It is up to you to take what was once a vision and make it a reality. It is up to you to go after what is now mostly only in your heart.